Oregon has a great mix of fly-fishing for the Trout and Steelhead seekers. The Deshutes and Umpqua Rivers have great fishing and there are great views of the Cascade Mountains for many of the trout streams. 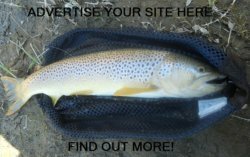 There is a nice supply of rivers that have fishing for the experience and beginner fisherman. Besides the great Trout and Steelhead rivers, there is also some great Salmon fishing along the coast and through the Columbia River. There is fishing for every type of fisherman, not just the fly-fisherman. 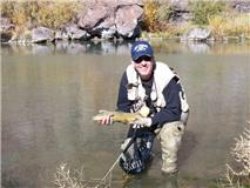 Many of the rivers listed are close enough that you could fish them all in a week, other than the Owyhee River. But the Owyhee is well worth the drive from western or central Oregon. The North Umpqua River is widely known for its challenging Steelhead fly-fishing. Both the river current, and the 8 lb Steelhead can be very strong. The North Umpqua River is 32 miles of fly only fishing. Be sure to read the special regulations for this river. The Owyhee River is located near the Idaho border and starts just below the Owyhee Reservoir Dam, near Adrian Oregon. The river is shallow and most people wade it although there are those who like a float tube. I fish there often and 80% of the fish I catch are 18” or better. It is not uncommon to catch a few over 25” in one day. That is a picture of me on the Owyhee in 2008. Most of the time I fish alone, but a nice guy who was watching me fish captured this 24" Brown. The Deschutes River is joined by Metolious River and Crooked River, both good fly-fishing streams on their own at Lake Billy Chinook where it becomes the Lower Deshutes River near Madras. 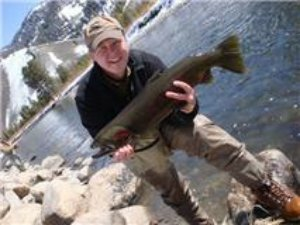 The Lower Deschutes River is widely known for the large population of wild Rainbow Trout, many of them exceeding 20” in length. The Crooked River is located in the central part of the state. 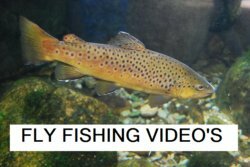 and is known for the abundance of Rainbow Trout. It is said to contain about 3,000 fish per mile, which would increase anyone’s chance of catching some fish. The McKenzie River is one of the best trout rivers in Oregon, it is located near Eugene. Although the river is open year round, March through October are typically the best months. McKenzie River area near Eugene.